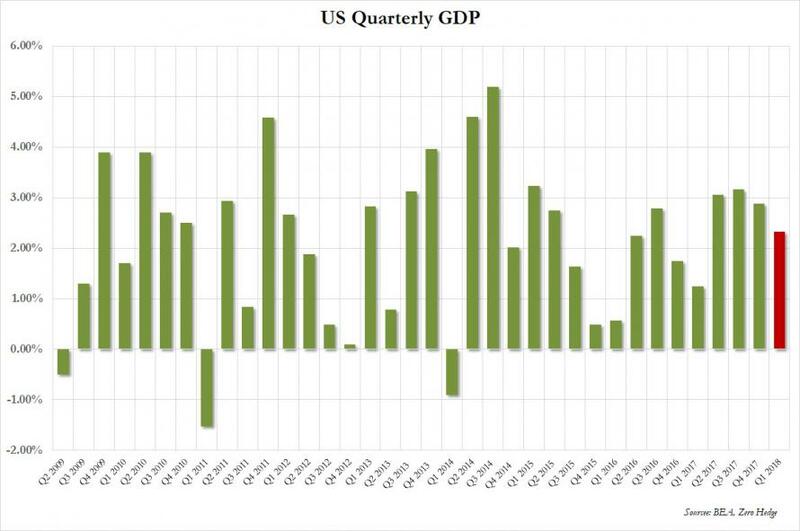 Q1 GDP was expected to be a big slowdown from the Q4 2017 GDP of 2.9%, mostly as a result of slowing consumption now that the front-loaded, credit-card funded euphoria from Trump's tax cuts is long gone, and that's precisely what happened when moments ago, the BEA reported that in the first quarter, GDP rose at a 2.3% annualized rate, which while the lowest in the past year, was better than the 2.0% consensus estimate. The increase in real GDP reflected increases in business investment, consumer spending, exports, and inventory investment. Imports, which subtract from GDP, increased in the first quarter of 2018. 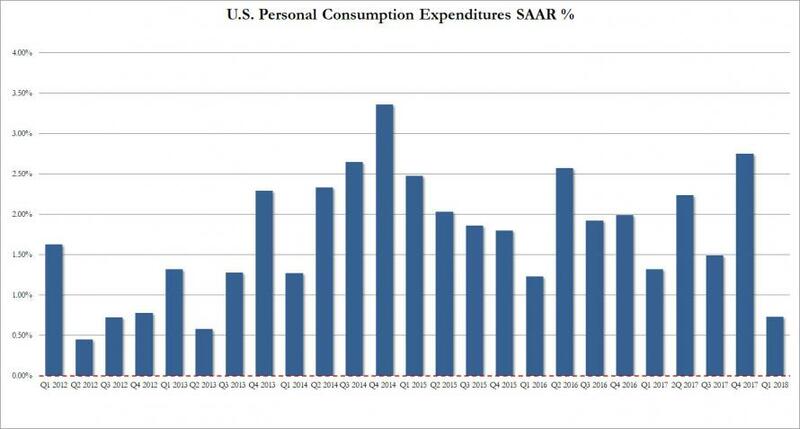 Looking at the components, the biggest cause for the drop in GDP was the sharp slowdown in personal consumption, which rose only 1.1% in 1Q, in line with expectations, after soaring 4.0% prior quarter, this was the weakest quarter for US consumer spending since 2Q 2013. Fixed Investment slumped from 1.31% in Q4 to 0.76%: so much for that CapEx boost. Exports dropped from 0.83% to 0.59%, while Imports subtracted 0.39% from GDP vs -1.99% in Q4. On net, trade contributed 0.20% to GDP, after subtracting -1.2% in Q4. 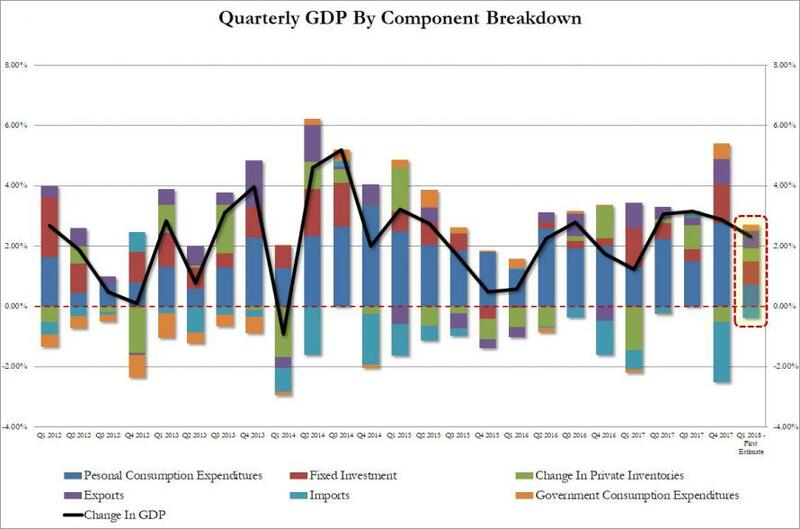 Finally government added 0.2% to Q1 GDP, after boosting Q4 GDP by 0.51%. On the inflation side, the news was a little "flatter" with the GDP price index rising 2% in 1Q after rising 2.3% in the prior quarter, and missing expectations of a 2.2% print. That said, core PCE rose 2.5% Q/Q in 1Q after rising 1.9% prior quarter, and matched expectations. 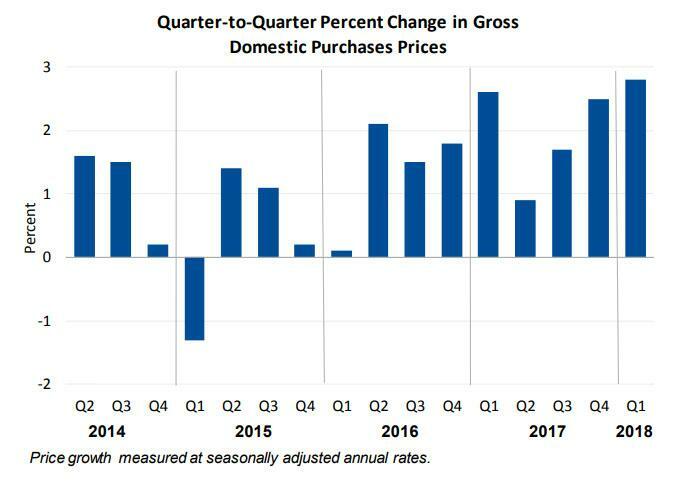 Overall, prices of goods and services purchased by U.S. residents increased 2.8 percent in the first quarter of 2018, after increasing 2.5 percent in the fourth quarter of 2017. Food prices increased 0.4 percent in the first quarter following an increase of 0.1 percent in the fourth quarter of 2017. Energy prices increased 12.4 percent in the first quarter of 2018 following an increase of 28.2 percent in the fourth quarter of 2017. Excluding food and energy, prices increased 2.7 percent in the first quarter of 2018, compared with an increase of 2.0 percent in the fourth quarter of 2017. Overall, this was a solid report, certainly better than expected, and with core PCE rising at 2.5%, it provides the Fed with even more reasons to hike rates in coming meetings.